10:00 – In the morning in the hotel lobby You will guide and excursion to Nikko! Do not say “Great!” Until you see Nikko! – So say the Japanese. 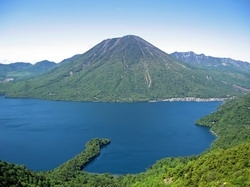 We offer you an exciting excursion into the national natural park of Nikko – one of the most beautiful places in Japan, renowned for its beauty and historical monuments. This fairy-tale world of mountain lakes and waterfalls. As trees are jumping monkeys, deer on the way out, and in the clear water floating trout. It is wonderful in all seasons. Park Nikko – Nikko covers Ridge Mountains, which are located in such peaks as the Nikko Sirane (2578m) and the extinct volcano old Nantan-san. The park is also located plateau, waterfalls, lakes and dense forests. Nantaysana eruption was formed the largest lake – Tyudzen-ji , fueled by Yukawa river, on which the waterfall Ryuji . Just a five minute walk from Tyudzen-ji Temple offers magnificent views of one of the most beautiful waterfalls in Japan – Kegon . His height – 97 meters. 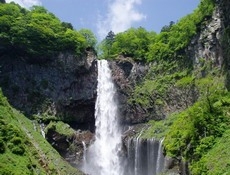 For the sharpness of impressions is available at 530 yen a lift that allows you to watch the streams of falling water. The most affluent period – from April to November. In the dry season falling stream may dry up, although there is an entire system of pumps pumping water through an underground pipe. Equally impressive sight is the Kegon and severe winter, when freezing jets and the influx of ice cascades. The park is the highest marshy area Japan – Odzega-hara , where the summer bloom lysichiton Kamchatka (family Araceae), cotton grass, azalea and other marsh plants. There are numerous hot springs in the park. 14:00 – . 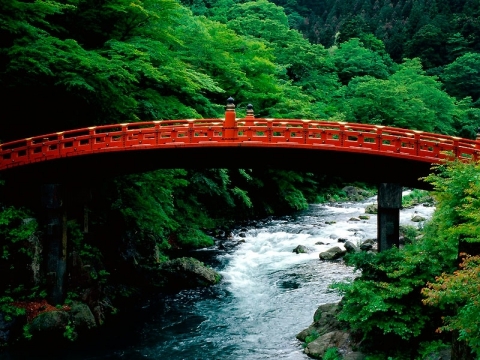 Continuation of the tour you will visit the city of Nikko, which is part of the park.Nikko history began 1,200 years ago, when a Buddhist monk Shodo shonin crossed the stormy mountain river Daiya on the backs of two giant snakes. A steep slope leads from the bridge to the svyaschennnogo temple Rinnodzi . This temple belongs to the largest wooden structure in Nikko. Before the temple stands a censer with incense. The Japanese are lit and put sticks here, which, burning, form clubs of fragrant smoke. Around incense people gather, they fanned himself with his hands, trying to attract to their side as much as possible of smoke. It is believed to help cure diseases, it removes affliction. Temple Rinnodzi known primarily hall Sanbutsudo (three Buddhas Hall) , which, as mentioned above, is the largest in Nikko. Gold-plated three-meter statues in this room correspond to the three mountain gods. 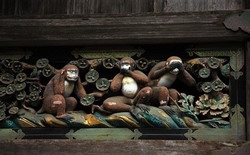 What is left to the head of a horse – a protector of animals Bato Kannon, the middle – the god of forgiveness Buddha Amida and the last represents the goddess of justice – thousand-Kannon. Around the temple there are two bronze lantern, tourists love to be photographed beside them, because they are very beautiful. In the XVII-XIX centuries. burial place of the shogun of the Tokugawa dynasty. In the XVII century.built Tosegu sanctuary of the mausoleum of the first shogun Tokugawa Ieyasu. Dynasty Tokugawa ruled Japan 250 years. 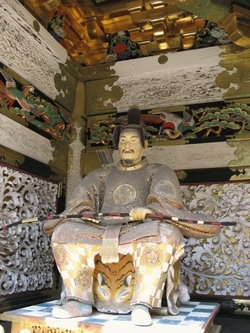 The first shogun of the Tokugawa dynasty – Ieyasu – chosen for his burial place is in the north-east of Tokyo, because, according to legend, evil spirits threatening the city from that direction. 20 years after the death of Ieyasu’s grandson Iemitsu called 15 thousand. Skilled craftsmen and more than a hundred well-known artists, to just build in the mountains of Nikko magnificent monuments for two years. It is magnificent in Nikko National Park, the Botanical Garden , where you will see a collection of more than 2 thousand species of alpine plants. Located in Nikko, you can visit the open-air museum of the Edo Mura (Village of the Edo era).You will get acquainted with the conditions of life of the princes of the Middle Ages and the samurai. The house is a ninja , which hosts demonstrations fighting members of this once popular in Japan profession, and stage area, which are the actors of Kabuki theater does not leave indifferent neither kids nor adults.